You are here: Home / Instagram Tips / What’s the Best Instagram Photo Size? NEW High Resolution! 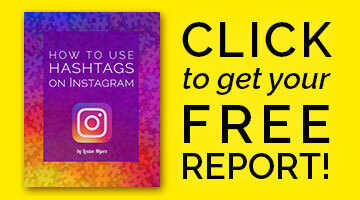 Looking to create images in the best Instagram photo size? I originally wrote this post in 2014 to alert readers that 612 was not the correct size any longer – it had been upgraded to 640. 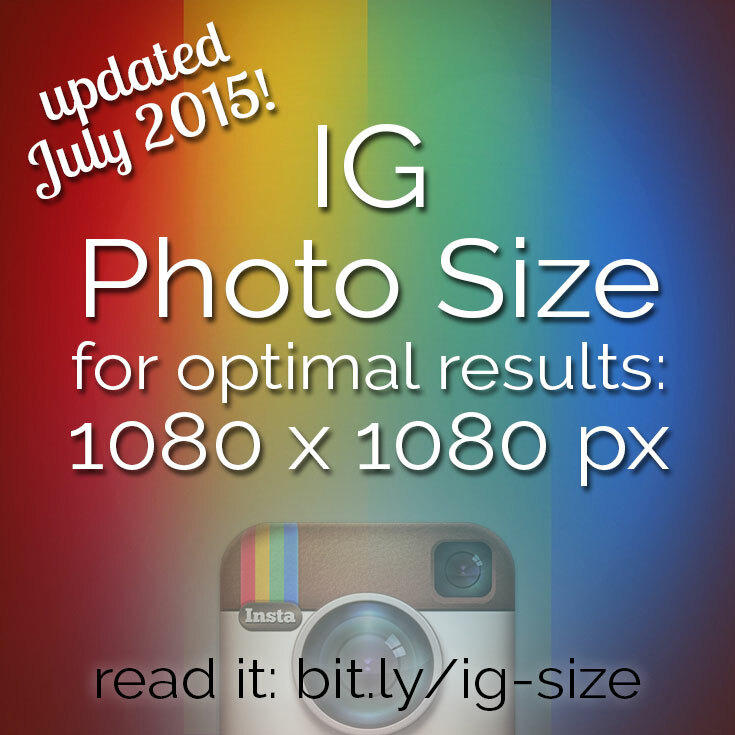 NOW Instagram has upsized another 168%! 1080 pixels is the new width for photos. 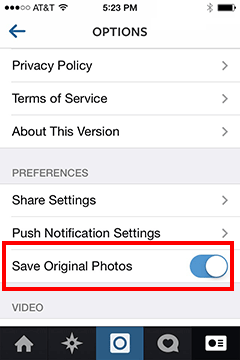 UPDATE AUGUST 27, 2015: Be sure to see this post about landscape and portrait Instagram images. The 1080 pixel width is a HUGE improvement in appearance. No more jaggy lines! (Big cheer from those of us who love sharp photos! 😉 ). It’s best to use these new dimensions, for optimal appearance. You definitely don’t want to post small images, as they may look bitmapped, blurry, and unprofessional when posted. I suggest you upload images at a minimum size of 1080 wide by 566 to 1350 high. I love the Instagram editing tools. Even when I do photo edits in Photoshop, I might add a little Lux or Saturation in Instagram. This generous and high-quality photo size brings an additional concern to me: people stealing photos. The previous size of 640 pixels at fairly low quality limited what anyone could do with your photos, if they downloaded them. Now they have a possibility of using them for printed work, and even reselling them digitally. I really hate having to take the extra step of watermarking my Instagram photos, but this may convince me it’s necessary. If you’re creating quality content that you don’t want an image thief to profit from, you may want to watermark your Instagram images, too. By the way, Instagram has indicated they have no plans to roll out the larger image size to the instagram.com desktop site. Please pin, like, or tweet this post if you’ve found these tips on the best Instagram photo size helpful! Made my day! Thanks Pete, glad this helped. I’m not sure why 612 is listed everywhere. 640 works for me as well. I think the size changed some time last year. Let’s hope it stays this way for a while! I love your website! I especially like how your blog entries have such great visuals. Thank you Louise, i have had problems using the 612px but with 640 i think it works just fine for me. I’m happy to hear 640 is working for you, Ebube! Just beginning to look at Instagram. Don’t know if I’m out of date on this but don’t we give Instagram a non-exclusive licence to use anything we put up? I can live with that on the 640px images but wouldn’t want them to have rights on high res, printable images stored on their system. Wondering what your take on that is. ps Apologies if this appears twice. My browser crashed on my first attempt! My understanding is we have to give them this right so the content can be shown and potentially shared by others. You can circumvent this by setting your account to “private.” But then only people you approve as followers will see it. “Instagram does not claim ownership of any Content that you post on or through the Service.” I don’t think they have plans to use it to create merchandise, for instance, but you’ll have to make your own judgement on that. I can’t find any evidence they store high resolution images. I’m doubtful they would – but you could always size images to 640 before posting! In producing an image from a vector file (ai) exporting into Photoshop for Instagram, what should the resolution be ? If the pix are set at 640×640? Glad you liked it Staci – thanks for your comment! Hi Louise, thanks for the info. Please do you know of any apps that would give the perfect full square picture (640×640) for Instagram photos. I’ve researched on the Internet but none of the apps I found gave me my desired result. I’m guessing that the apps give a larger image? Larger is fine, and actually a good thing as the images can be used for other sites / purposes that work better with larger. 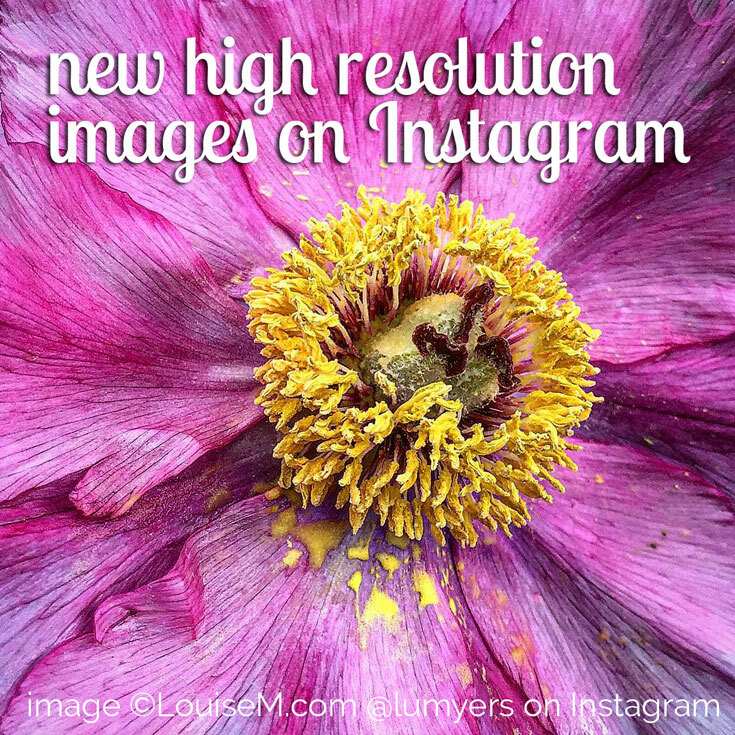 Instagram will downsize them to fit 640 x 640 and you shouldn’t lose quality. What you want to avoid is posting something smaller than 640, as that would be enlarge when posted, and definitely lose quality. So happy this helped, Madhav! Now that Instagram images are 1080 square, I’m trying to figure out the optimal file size of an image. Previously for 640 square I used to export in Lightroom at max size 120kb. This ensured minimal compression applied on Instagram side. What are your impressions?? I’m impressed that you figured that out! While I rarely pre-edit my Instagram photos on desktop, when I do I save them at max file size, figuring that was the best option. Sorry I don’t have an answer for you! I could probably use your tips! Thanks for the tips Louise! I’ve been scouring the web for weeks about optimization for IG pics and yours is the only one that mentions 1080 x 1080 so thanks for enlightening all of us! One other question relating to editing photos: Someone was saying that you should save in PNG format rather than JPG as the compression is less and results in better quality uploads to IG. Any thoughts on this? What format do you use? That’s a great question. I know that is true on Facebook (or at least it used to be). I’ll have to test it on IG. I’ve been using JPG. Thanks so much for this article! You are the only one mention this awesome information!!!! It is true that now we have to start watermarking our images, but as Professional Photographer love the high quality images. I’m using IG on Android, but seems that I can’t use images larger than 640px. Do you think only works on Apple devices? 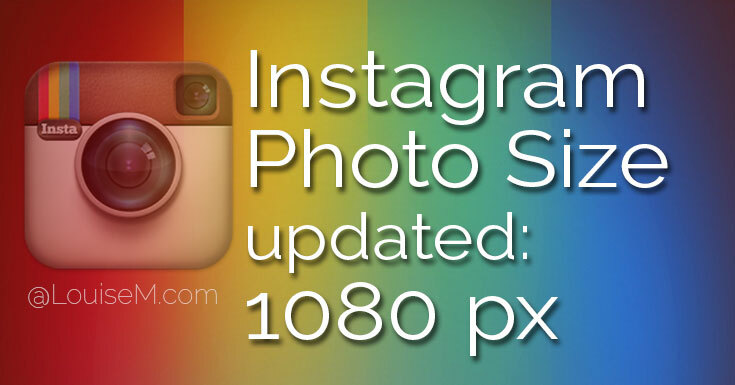 My source said that as of July 1, Instagram started gradually rolling out 1080 across iOS and Android. You should have it by now, unless that was an error. Not sure what you mean “can’t use images larger than 640px.” On iOS I can use huge images, but they get downsized to 1080 width in the Instagram app. I can verify this by the size they post through to Facebook. Maybe you could try that and see what happens? I’d be curious to know. – If the image have a square size and it’s larger than 1080px it’s OK, the app will downsize the image to 1080 sq px. – Seems that Instagram it’s upgrading the app on Android gradually (I’m not quite sure), just depends on what version are you using, I’m using KitKat… So, I had to wait a few days for the upgrade and I have it now! Thanks Louise. Was very helpful and easy to understand ^_^. Such an informative post about ideal Instagram images. Thanks Louise for crafting this article. I’m glad you enjoyed it, Hemlata! Great tipz. Thanks for all you do! Not sure I have a good answer for you. Of course, vector isn’t supported by social media platforms. PNG is probably your best bet. You could try doubling the resolution – 2160 x 2160. Just beginning to look at Instagram. Don’t know if I’m out of date on this but don’t we give Instagram a non-exclusive license to use anything we put up? I can live with that on the 640px images but wouldn’t want them to have rights on high-res, printable images stored on their system. Wondering what your take on that is. please, Apologies if this appears twice. My browser crashed on my first attempt! Welcome! Glad you like my site. I believe any social media platform needs rights to content we post so that it can be shared by them and/or their users. If you have concerns that they might sell your photos or something like that, you should consult with an attorney… I’m not qualified to make a call on that. I haven’t used Illustrator to create raster files. Why not save it as a vector, then import it into Photoshop at the pixel size you want? Then save. Should work better for web and app use. the question is why it is with white Background? so it looks small when I post it on Instagram >> so do I have to zoom it out on the Instagram ? Sorry, I’ve never had that happen so I don’t know. But make sure your image is large enough. I’d love to use larger photos but since IG still crops them to square, where is the best place for my watermark? I’d like it to show up in the cropped version but have a feeling it will seem to be floating in midair. Some people find a way to tuck it where it works/fits in the particular photo. I personally wouldn’t worry about it showing in the gallery, but that’s up to you. A friend is self publishing a book and wanting to use some of my instagram photos. Unfortunately, I don’t have them saved anywhere – the only version I have is the one available on instagram. In the proof print of his book they’re unsatisfactory. Therefore I’m hoping there’s someway I can get the image off instagram and improved to 300dpi. I’ll be so grateful for any advice! There’s no way to truly improve the quality and resolution of photos. There is software you can use to do an adequate job of increasing the resolution. And I believe there are services that can download your IG photos.